Tone purists may turn their noses up at multi-FX but for any player wanting to nail an awful lot of sounds on a budget the RP500 is invaluable. Combining design elements of the smaller units with a crisp new silver/black look, the RP500 is the latest and largest addition to the RP range. Although it's by no means a direct replacement for the previous flagship of the range, the RPx400, it offers a similar halfway house option for players who find the smaller RP units too limiting, but are reluctant to make the step up to the complexity of the GNX units. The RP500 isn't quite the 'total bedroom music solution' that we saw with the old RPx400 (nor is it as expensive) but makes for a perfectly useable practice hub. A CD/MP3 input allows you to connect the external equipment of your choice, and there's a USB connection that can be used either for direct digital recording or for using the X-Edit graphical editing software. For recording purposes, the RP500's USB connection supports four channels (two in, two out) of audio, and DigiTech has helpfully included Cubase LE 4 to get you started. In case you want to plug into a standard amp, the amp/mixer switch optimises the output signal, and there are twin XLR outputs for connection to a mixer or recording device. Unlike the smaller RP units, the RP500 sports five individual patch footswitches along with up/down bank switches. There's also an independent bypass footswitch (much less confusing than on the GNX units, where you hit the currently active patch switch to bypass) and a tap tempo switch. 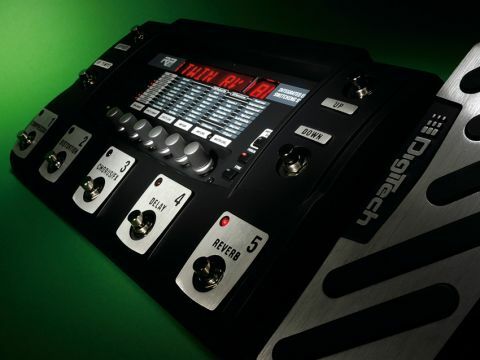 The rest of the layout follows familiar DigiTech lines, with the 'matrix' editing display and a single expression pedal. "The tough build quality, range of sounds and flexibility of use are very impressive at this price." The RP500's default status is 'pedalboard mode', whereby the up/down switches are used to navigate linearly through the patches, and the five main footswitches are used as virtual stompboxes, allowing you to add or remove effects within a patch. The five effects modules affected in this way are Compressor, Distortion, Chorus/FX (covering a huge range of effects), Delay and Reverb. Should you prefer the more traditional 'preset mode', there's a dedicated pushbutton on the main control panel for toggling between the two modes. This flexibility is reflected in the dual approaches to modifying and designing sounds. The simplest approach (in either pedalboard or preset mode) is to use the Tone Library and Effects Library knobs. This is a recent DigiTech development, allowing you to make broad changes using preset amp/cabinet chains and/or effect chains. The RP500 has 40 tone configurations and 42 effects configurations, so it should be easy to get pretty close to the sounds you need. The Tone and Effects Libraries work independently of each other, so you can mix and match. For a more precise approach to tone design, the RP500 works just like almost every other DigiTech pedalboard effects unit. You use the Edit buttons to scroll up/down through the modules listed on the left of the matrix display, and then adjust the parameters with the knobs at the bottom of each column. There are 100 factory presets and 100 user memory slots, and the RP500 can run 10 simultaneous effects modules. Actually choosing what effects to use may be the most difficult aspect of learning to use the RP500, as it features a whopping… well, we lost count, and the user manual doesn't give an exact figure. To give you an idea, there are 18 types of distortion, 52 amp models (including a couple of acoustic simulators), the usual range of modulation and filters and DigiTech's famous Whammy and pitch-shift effects. For extra user control, the expression pedal can be configured to almost any parameter, as can the two LFOs (Low Frequency Oscillators) for creating automated effects. Most people are familiar with auto-wah, tremolo or panning in this respect, but you could easily program the RP500 to produce a repeating variation in distortion, reverb length, flange depth... use your imagination! Plenty has been written about the powerful DigiTech AudioDNA2 processing in the past, and the RP500 is every bit as good as its stablemates. Most of the amp models were familiar to us from previous GNX and RP units, but there's a tasty collection of newcomers, including the bluestastic Gibson GA-40, the Orange OR120 (classic early seventies rock crunch) and a whole series of genre-specific DigiTech models. The overall output level was a bit quieter than we expected (compared directly with a GNX3000) but most of the presets seemed to be set with quite modest master volume settings, so there's scope for extra oomph. Be careful with some of the clean sounds if you're monitoring through Hi-Fi speakers - there are some serious transients there! The only real issue that strikes us is the feel of the expression pedal. It's quite small, as on many multi-effects units, so the physical range isn't particularly wide, but the one on our review model is also quite stiff, which makes things sound a bit jerky. The modulation effects are comprehensive, covering everything you're likely to need and then some… there are some very impressive presets making use of various pitch-shifting effects. The Scattertrem effect is also great for non-guitar-like electro sounds. Although the RP range is not nominally aimed at pro musicians, there's no reason why you couldn't base at least a pub-gigging rig around this unit. The tough build quality, range of sounds and flexibility of use are very impressive at this price.